by Mary Peteranna and Steve Birch. 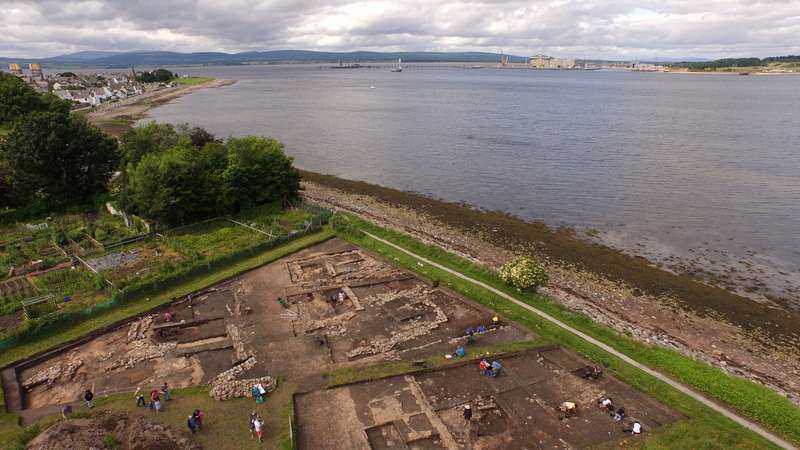 Aerial view of Reeds Park during excavation 2015, looking towards the modern town and the Cromarty Firth (Garry MacKay). 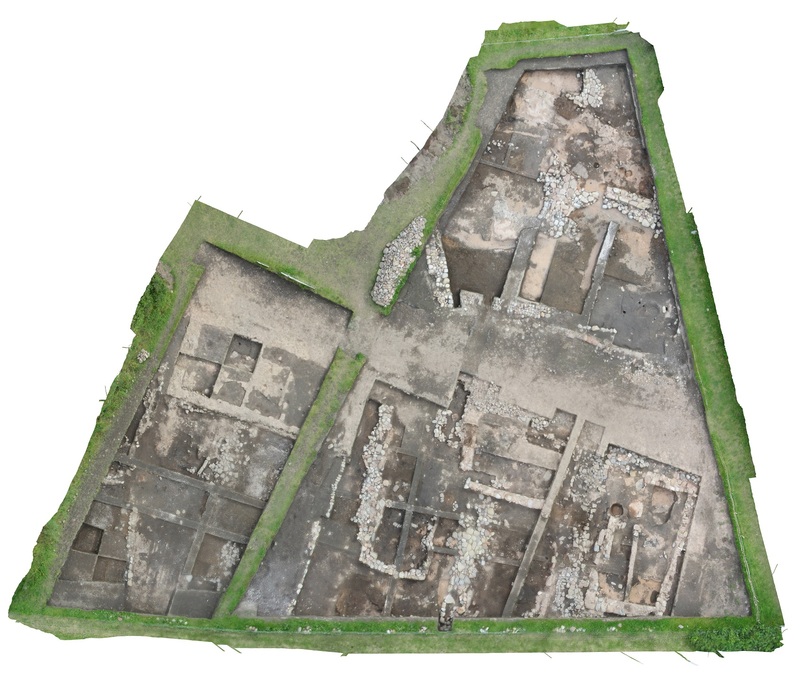 Two corrected aerial photographs of the Cromarty excavation site by Alan Thompson. Above is the view towards the end of excavations in 2015. …and this image shows the substantial progress made by the end of the 2016 season. The burgh of Cromarty was set in a strategically important location, controlling the entrance to the Cromarty Firth and the ferry crossing on the coastal route north of Inverness via Nigg, the most direct route to the medieval shrine of St Duthac’s in Tain. 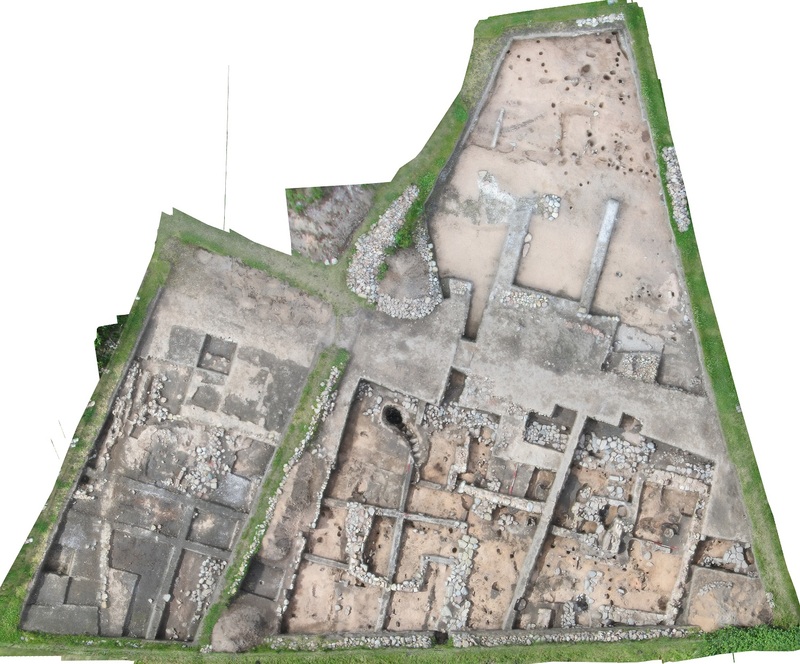 Cromarty was a natural location for a medieval power centre, with good coastal access and rich agricultural hinterland, strategically located on a key frontier zone in Northern Scotland. Unlike other areas of the north and Highland regions that were under clan control, Cromarty fell under the feudal authority of the Scottish crown. Although there is little documentary evidence for the town’s medieval history, it has been suggested that it was the logical location for a thanage in the 11th/12th centuries. A castle situated at Cromarty would have been a sensible location to establish royal authority on this borderland. While it was documented that the town’s sheriffdom had been established by 1266, little was known about the early history and layout of medieval Cromarty. This entry was posted in Black Isle, Excavations, Medieval and tagged Archaeological dig, archaeology 3d Model, archaeology highlands, Black Isle archaeology, c14 radiocarbon results, cod fishing, Cromarty Medieval Burgh, Mary Peteranna, medieval archaeology, medieval buildings, Medieval ceramics, medieval well, millstone, photogrammetry, pony skeleton, quadcopter, quern hearth setting, quern stone, stepped well, Steve Birch, stone disc stoppers, thief's row, wattle and daub on November 5, 2016 by nosas.